Before a decade or two people use to color their hair in natural ways. But, due to the massive development in the field of cosmetics, everything became synthetic and natural to use. With all these advancements, Coloring your gray hair is no more a big deal. But, what if the chemicals in the hair dye’s leave your hair dry, dull and lifeless? Not just these effects, but sometimes they may raise problems like Itching, Hair breakage & skin discoloration. So, it’s time to switch from synthetic dyes to Natural Home remedies for gray hair treatment. These natural remedies for white hair are safe to handle and use. In most of the instances, they are devoid of side effects. So, start using these simple but efficient natural home remedies for gray hair and have a happy hair. Also know, how to prevent gray hair by home remedies. Home remedies for treating gray hair are inexpensive, safe and efficient. Amla, Henna are Ayurvedic treatments for Gray hair. Prevent premature gray hair using the below at home remedies. From hundreds of years, henna or mehndi is used for coloring our body parts in various patterns. Also, many people use this henna pack for hair to condition your hair. It is one of the natural remedies for hair growth. The leaves of henna have the ability to reverse gray hair naturally on regular usage. So, the benefits of applying henna for hair and use it twice a month to own beautiful hair. Henna powder is commercially available in the market. But, there are many brands which may confuse you in selecting the best. So, keeping all of them aside just use natural henna for hair which results in soft, black, shiny hair. Henna is one of the best Home Remedies for Gray Hair that is safe and simple. Collect fresh henna leaves and wash them under running water. Grind the henna leaves into a fine paste and add lemon juice to it. You can also add vinegar if you desire and leave it for 30 minutes. Then, just comb your hair to remove any tangles if present and make your hair into small partitions. Start applying hair from forehead to back till the end of your hair and leave it for 1 hour and then take a shower. Repeat this twice or thrice a month to ensure that your hair turns black completely. Note: If you like you can sun dry the henna leaves and powder them for future use. This sour fruit exhibits various health and beauty benefits. Of them, treatment of gray hair is one. 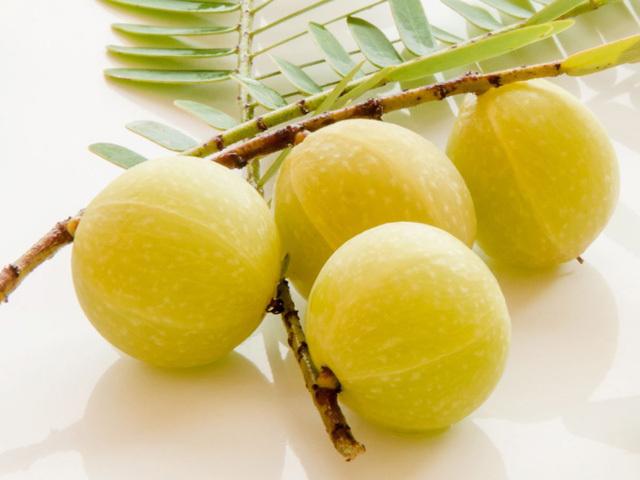 Using Amla or Indian Gooseberry is a permanent solution for gray hair that can even reverse gray hair naturally. So, know how to use the Amla for Hair. Amal possesses astringent properties that can contraction of the cells and therefore lock the color naturally. But, it needs some support for this. So, add henna to Amla juice or amla oil or even amla powder to get the required properties. Amla or Indian Gooseberry will tone down the red and helps in producing a much deeper, browner tone in henna hair treatments. Add lemon juice as per consistency without adding the lemon seeds. Mix all the ingredients well and apply it to your hair from roots to the tips and leave for 45-50 minutes. Wash your hair with lukewarm water, and leave it to air dry it. Do not use hair dryers after applying the Henna-Amla Hair Pack. 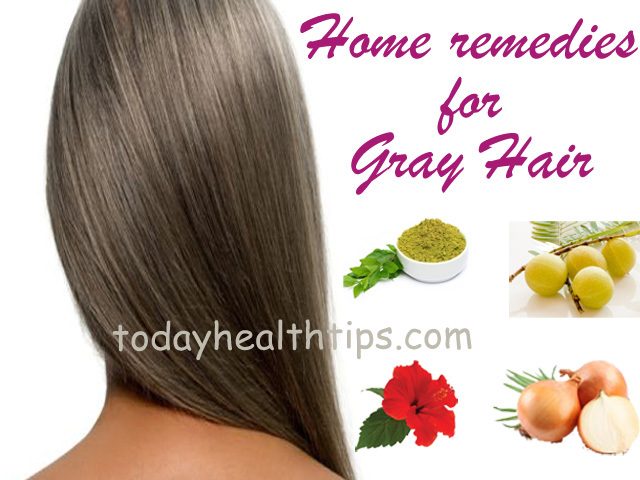 Use this simplest of all Home remedies for gray Hair reversal to get healthy, bouncy black hair naturally. One of the best folk medicines to treat gray hair is Hibiscus. Both Hibiscus flowers and Hibiscus leaves are used in the treatment of Gray hair.Hibiscus flower stimulates blood circulation and rejuvenates the scalp. The medicinal benefits of hibiscus help to delay premature graying of hair and even promote healthy hair growth. 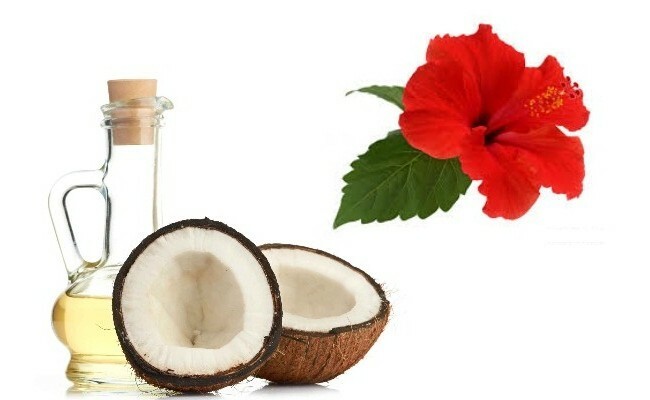 The Hibiscus flowers can stimulate the blood circulation and also helps in rejuvenating the scalp. The medicinal benefits of hibiscus will assist in delaying the premature graying of hair. Use this home remedy for gray hair regularly. Collect 10-12 fresh hibiscus flowers and few leaves. Add 4-5 cups of water in a pan and add the collected flowers and leaves. Boil the contents for 20-25 minutes, and strain the water and keep them aside. Let it cool down to normal temperature. You can mash the flowers and leaves to make a fine paste. The, gently Massage hibiscus paste into your scalp and leave it for 30-40 minutes. Use the water strained to rinse your hair after 40 minutes. Then take a shower with mild shampoo. Use this best home remedy for at least thrice a week. Have you ever heard that we could use Onion juice or Onion paste for white hair treatment? Do you know how to make onion paste for hair? Then know how onion juice treats white hair problem naturally. The hydrogen peroxide formed as the by-product of cell respiration is responsible for graying our hair. The hydrogen peroxide build up was due to the reduction of an enzyme catalase that breaks the hydrogen peroxide into water and oxygen. Our body cells also make the enzyme Catalase to remove hydrogen peroxide. So, when our body fails to produce enough amount of catalase it interrupts the formation of Tyrosinase, an enzyme which leads to the production of melanin in hair follicles. The Onion juice or onion paste is rich in the enzyme Catalase. So, the enzyme Catalase neutralizes Hydrogen peroxide and reverses gray hair. When the Hydrogen Peroxide levels increase at the hair follicles, it causes stress and leads to gray hair. So, Use any of these gray hair treatment remedies to prevent your hair from premature graying. Then, Cut the onions into medium sized pieces. Using a juicer or blender make subtle onion paste or juice. How to apply onion juice to hair? 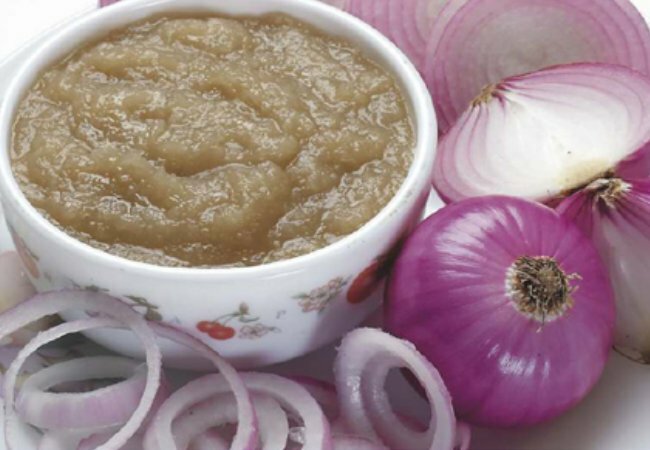 After making a fine paste of onions, take onion paste into your hands and gently massage the onion juice on your scalp. This onion juice can stimulate your hair follicles. Leave the onion juice or onion paste for 30-40 minutes by wrapping a cotton towel around your hair. Repeat this once a week to change the hair color from gray to black. So, these are best home remedies to treat white hair naturally. Choose any one of the given methods or use the above home remedies for Gray hair at young age alternatively twice or thrice a month. Depending on the extent of Gray hair you have, decide the intervals between two applications. Besides using these, Apply hair oil twice a week. Also, use the oil that is made by boiling Banyan tree roots to make your hair stronger and reverse gray hair naturally. If you know more home remedies that can treat gray hair problem, please let us know in the comment section.